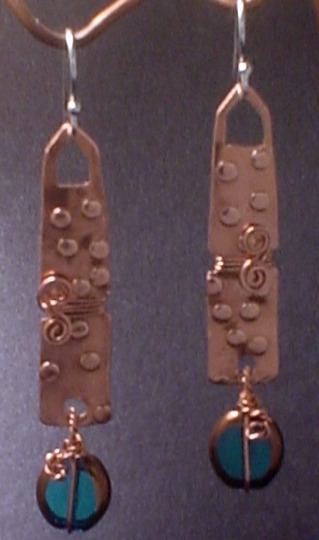 If I were conducting an in-person metal jewelry making class, by the end of lesson one I would have reminded you to purchase a jeweler's saw and lots of blades to practice cutting. If you returned to class the following week, (some students don't come back after the first class) I would welcome you back, congratulate you on getting over any beginner's frustration and ask you to pull out your first practice piece. Hopefully, you started out simply, creating a simple shape (not a circle) for a pendant or perhaps two pieces for a pair of earrings. By the second class you probably would have figured out that a round shape sounds simple enough, but it's one of the hardest to cut; so maybe you created a triangle or perhaps an oval instead. You've cut out your first piece, now you're ready to take the next step to turn that simple metal shape into creative DIY jewelry pieces. No matter how gracefully you perform up-and-down sawing motions, when you're finished cutting with a jeweler's saw the edges of your piece will be a bit rough. You can smooth them with a good set of metal files; but as a beginner, your metal work destiny may be uncertain. 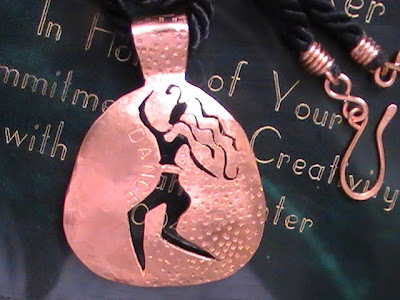 Avoid the metal file expense until you know metalwork jewelry is your destiny. An assortment of emery files (like the ones above) is a cheaper make-do alternative to expensive metal files. You know those thick black and pink files you use to shape your fingernails. Just like sandpaper, they range in grits from rough to fine. They do an excellent job of filing away rough metal and smoothing edges. Start with a rough grit file and finish with a fine file until the metal edges are smooth to the touch. Use the fine grit to smooth away surface scratches and tool marks. You can also use fine grit sandpaper to smooth your edges, but you're not likely to find the fine grit papers in a traditional hardware store. Check an online jewelry supplier that sells metalsmith supplies. For ease of use, wrap your sandpaper around a pink or black emery file. After you buy files, you may realize you prefer the cheaper alternatives. What is a stamp? Stamps are short, hard metal rods with a design on one end. 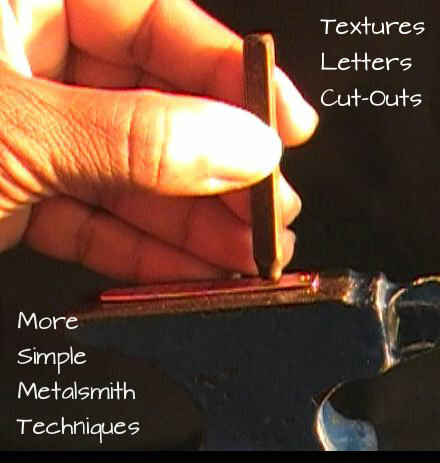 You can use them to add texture, patterns, depth, or an interesting look to your simple metal jewelry creations. 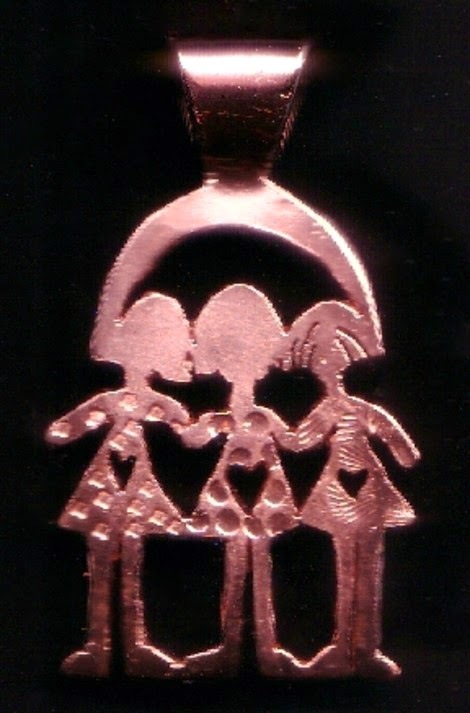 Hold the stamp upright with the decorative end resting against the metal. Hold the stamp firmly in place then strike it with a hammer until it makes a deep enough impression. Repeat as to create a pattern. Interchangeable screwdrivers have removable tips (bits) you can use in place of stamps. Don't hit the rubber or plastic screwdriver head. Remove the tip before using it. Strike the metal surface repeatedly to create a unique texture. Use Center punch tools to create a pattern of dots. Use a screw to make a small dot pattern. Nails can create several different textures for different results. Use a manual hole-punch to create a series of indentations ( see earrings below) for a three-dimensional, polka-dot texture. Love? Joy? Peace? Whatever you want to say, stamping letters on your handcrafted jewelry can be an easy way of sending a message without saying a word? Alpha-numeric stamps are a bit awkward to use at first. It's difficult to space letters the way you want them without some preparation. Plan your work for optimum effect. Mark the spacing on your metal with a felt tip pen, a line for each letter. Take your time. Make sure you have the letter or number stamp facing the right way before you strike it with your hammer. Once you strike a stamp against metal, it creates a deep indentation. If your letter or number is upside down or sideways, it's practically impossible to remove. Consider drawing a mark at the bottom of your stamp as a visible reminder that you have the stamp positioned correctly. A ball peen hammer (a hammer with one rounded end) is great for adding a simple, nubby texture. Hammer the entire surface of a metal piece or just a portion. The texture will be bumpy, and sort of rough, but interesting. This piece and the pieces shown above began with simple line drawings. Draw a woman, a man, or a heart on your metal. Get complicated with a filigree pattern. Pierce the metal with a drill and cut away parts of the metal to render your design. It takes practice (and a few broken blades) to make the saw do what you want it to do. Don't get frustrated. Cutting with a Jeweler's saw is like riding a bicycle. It's not very easy at first, but the more you practice, the easier it gets. And once you learn how to do it, the skill always comes back to you. Use plenty of blade lubricant. It helps keep the saw moving smoothly. Buy the best blades you can afford. You can feel the difference in quality. Practice cutting straight lines and curves to develop your confidence. Eventually, you'll want to do something a bit trickier, something with corners and angles. To turn an angle, let the blade do the work. Keep the blade moving in a smooth up and down sawing motion while gradually turning your metal piece until the blade is facing the new direction. It takes a little patience.